It’s time to reconnect, set intentions and continue riding the wave of 2019’s growth energy. So, join us on February 26 for our first community meet-up of the year! 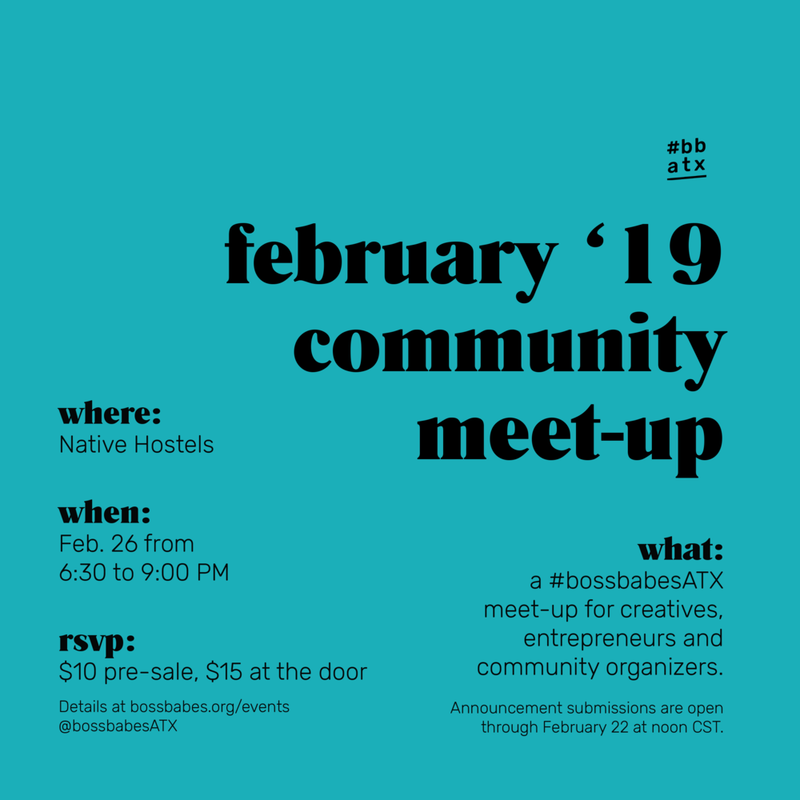 〰️With a selection of local vendors and opportunities to mingle, the night will begin with three stories of resilience from inspiring thought leaders living and working in Austin, Texas. After our speakers hit the stage, we’ll feature 25+ community announcements from women and nonbinary creatives, entrepreneurs and organizers. All people and professions welcome. You’re not required to be all of yourself at once. Feel free to hold yourself accountable to these mantras, too—and come to the meet-up with your own thoughts on what they mean to you. This month's topic question is "What are you here to learn? What are you here to teach?" Anonymous answers will be collected during the meet and later shared on our blog. Visit this portrait station for a commemorative snap with artist Jeanette Nevarez. Support Women Artists, Babe AF, Texan Feminist and Life's a Spectrum, Baby tees will be available for $20. All purchases support the continuation of our programming. DJ CASS&RA (pronounced DJ Cassandra – female DJ based in Austin, TX) is the DJ side project of composer + keyboardist Cassie Shankman. She primarily plays a mix of funk, disco and house, but other sets have included classic hip-hop, rap, indie-electronic-pop, club mixes, top-40s, and world music (open format DJ). As a trained musician who understands the musical theory behind songs, Cassie began DJing friends' house parties, creating a good vibe, and began growing her audience and clients. She now DJs for crowds of over 3,000 people. DJ Cass&ra is part of #BBATX’s residency program. Amberly Washington is the owner and Creative Director of REVELRY and The Swoon Event. REVELRY is a creative production studio that specializes in event production, venue management and pop-ups. Through REVELRY, Washington produces The Swoon Event, a curated wedding showcase with stops in Austin, New Orleans, San Diego and Dallas. Learn more at thisisrevelry.com. Designed and fabricated by hand, Hannah Parks creates unique metal jewelry and goods. With a focus on homeopathic methods of healing and medicine, Adriana Jacobson offers naturopathic services and goods. Bailey Dieckman is a digital illustrator living and working in Austin, Texas. Sourced from Atlanta, Denver and Austin, Hey Elayna offers all shapes and sizes in variety of vintage styles in women’s and men's fashions. Morgan Thomas is a designer and illustrator based in Austin, Texas. Rosa Bee Botanica specializes in non-toxic herbal tonics, balms, candles, and sprays made with care and the cleanest ingredients. Bad ghoul jewelry creates handmade fruit and veggie earrings in Austin, Texas. Online pre-sale RSVPs are $10 and $15 tickets will be available at the door.